One of the biggest names in Cosplay and her version of Vegeta. 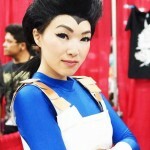 It’s the first female version of Vegeta I’ve seen and since this appearence there has been a lot more similor cosplays with girls dressing up as the main characters from DBZ. Visit Vampybitme’s Facebook page ofr more from this cosplay superstar.